What has happened to BeastSkills.com? It’s September 28th, 2014, and a beautiful Sunday here in Washington DC. I’ve wanted to write this post for some time, to answer past questions and to give you a idea of future projects. This will be quite a ramble. First off, I want to express my heartfelt gratitude for all the support over the years. Everyone who has visited the page, shared it with a friend, sent me an email or comment, or I’ve met in person – thank you. I never want you to think a lack of site updates is somehow an indication that I don’t appreciate each and every one of you. Starting this site has literally changed my life. Let’s take a quick look back – to 2004. That is not a typo, Beast Skills is turning 10 years old in November! In terms of internet time, that’s ancient. This was the year I decided to start the Beast Skills blog to share what I had learned in my own training. I was quite grateful for other sites I had come across (Chimp’s Capoeira, anyone? ), and I wanted to provide a resource myself. I wanted to help people. If you can think back to the person you were 10 years ago, or even 5 years ago, you will start to understand how much I might have changed in regards to my life, my training, and especially my knowledge. Some of the tutorials I have written for this site are nearly as old as the site itself. While much of the information is still useful, I have undoubtedly changed my teaching methods and beliefs in many minor and major ways. Writing a tutorial the first time around is quite mentally exhausting for me. I have difficulty doing it over the course of several days or weeks, so instead I have to sit down for many, many consecutive hours. I would write and rewrite, read and re-read. The thought of doing that each and every time I adopted a new drill or cue for a skill was too overwhelming – especially as I knew that I might be updating it again in a few months. I also often don’t like reading some of my really old writings. To paraphrase Tomi Ungerer, I am often allergic to my past work. Instead of constant revisions and rewrites, I have been posting various updates and ideas to my Facebook and Youtube accounts. While a full blog post or article is often maddeningly time-consuming, a quick post to either one of those sites is relatively painless. A look on either will show you that, yes I am in fact still training! What else have I been doing? Giving seminars! For a number of years, I was traveling quite regularly to give gymnastic seminars at various CrossFit gyms around the country. I loved this – seeing new places, meeting awesome athletes. It was very fun, but the travel does wear you down a bit, as it extends my work week to 7 days. The ability to meet and coach numerous athletes was very important in developing my teaching abilities and specific drills. I will certainly be giving seminars in the near future (having just presented at Camp Nerd Fitness a week ago), so please keep an eye out for them on the main site, or Facebook. I have also been taking a lot of seminars/remote coaching too – reaching out to acrobats I greatly admire such as Yuval Ayalon, Yuri Marmerstein, and Ido Portal, among others through the years. Their expertise has been invaluable in my development as an acrobat. I have bothered them too many times to count, and grown immensely in the past few years alone. Make time to reach out or travel to those with the knowledge you seek, as it will greatly accelerate your training. Be sure to remember that it will cost you though, so be gladly willing to pay people for their time and talents. 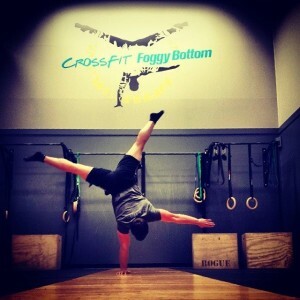 Lastly, I’m currently the CrossFit Director at CrossFit Foggy Bottom in Washington DC, which has been a huge amount of work and responsibility. We managed to win “Best CrossFit Gym” in 2013 despite being less than a year old. I love the experience of being able to help so many athletes on a daily basis. So between coaching classes, coaching Personal Training clients, and training myself, I am away from the computer a lot. So what else is in the future? What do I have in store for Beast Skills? Again, updates to the main site and the tutorials are not out of the question. The twitter feed on the front page needs fixed (my actual twitter account is fine), the comments have been having issues, and the newsletter submission form started going haywire this week. This will all be handled eventually, but I am doing so much more in the meantime. I know that time spent training myself and others will be a bigger benefit than time spent finely revising this page. So thank you for the understanding. Come out to one of my seminars, visit me in person, engage in the ongoing conversation on one of my other social platforms. I am enjoying my training right now – stronger, smarter, and more pain-free than at any time before. This post then is to let you know I’m a-ok. Thanks again for all the support – now get away from the computer and get back to training!